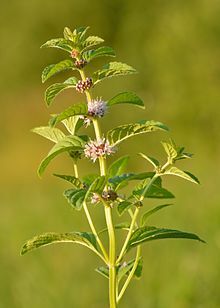 Mentha arvensis, the corn mint, field mint, or wild mint, is a species of flowering plant in the mint family Lamiaceae. It has a circumboreal distribution, being native to the temperate regions of Europe and western and central Asia, east to the Himalaya and eastern Siberia, and North America. Mentha canadensis, the related species, is also included in Mentha arvensis by some authors as two varieties, M. arvensis var. glabrata Fernald (North American plants such as American Wild Mint) and M. arvensis var. piperascens Malinv. ex L. H. Bailey (eastern Asian plants such as Japanese mint). Wild mint is a herbaceous perennial plant generally growing to 10–60 cm (3.9–23.6 in) and rarely up to 100 cm (39 in) tall. It has a creeping rootstock from which grow erect or semi-sprawling squarish stems. The leaves are in opposite pairs, simple, 2–6.5 cm (0.79–2.56 in) long and 1–2 cm (0.39–0.79 in) broad, hairy, and with a coarsely serrated margin. The flowers are pale purple (occasionally white or pink), in whorls on the stem at the bases of the leaves. Each flower is 3 to 4 mm (0.12 to 0.16 in) long and has a five-lobed hairy calyx, a four-lobed corolla with the uppermost lobe larger than the others and four stamens. The fruit is a two-chambered carpel. The related species Mentha canadensis is also included in M. arvensis by some authors as two varieties, M. arvensis var. glabrata Fernald (in reference to North American plants) and M. arvensis var. piperascens Malinv. ex L. H. Bailey (in reference to eastern Asian plants). In ayurveda, Pudina is considered as appetizer and useful in gastric troubles. In Europe, wild mint[which?] was traditionally used to treat flatulence, digestive problems, gall bladder problems and coughs. The Aztecs used it for similar purposes and also to induce sweating and cure insomnia. The oil was extracted and rubbed into the skin for aches and pains. The Native Americans also used it in several traditional ways. It is currently used in many countries for various ailments. Mint extracts and menthol-related chemicals are used in food, drinks, cough medicines, creams and cigarettes. Chemical substances that can be extracted from wild mint include menthol, menthone, isomenthone, neomenthol, limonene, methyl acetate, piperitone, beta-caryophyllene, alpha-pinene, beta-pinene, tannins and flavonoids. Menthol is widely used in dental care as a topical antibacterial agent, effective against streptococci and lactobacilli. The oil extracted from Japanese mint can consist of over 70% menthol, which is commonly used in pharmaceutical and oral preparations like toothpastes, dental creams, beverages and tobacco. Two main diseases that can significantly damage Japanese mint (M. arvensis var. piperascens) and its yield are the rust fungus and the mildew attacks. Mildew attacks usually only occur on the west coast of United States where the weather can be foggy and humid, a condition that attracts mildew. Rust fungus is a disease that is common for most of the Mentha plants such as peppermint and spearmint. These diseases are flagged due to the almost to none probability of controlling once it starts in a mint farm. They are typically cut immediately when discovered to help reduce the probability of contaminating the rest of the plant leaves. ^ "Mentha arvensis". Germplasm Resources Information Network (GRIN). Agricultural Research Service (ARS), United States Department of Agriculture (USDA). Retrieved 18 December 2017. ^ a b "Mentha canadensis". Germplasm Resources Information Network (GRIN). Agricultural Research Service (ARS), United States Department of Agriculture (USDA). Retrieved 18 December 2017. ^ "Corn mint: Mentha arvensis". NatureGate. Retrieved 2013-12-12. ^ "Mentha sachalinensis in Flora of China". Flora of China (series) Vol 17. p. 237. Mentha sachalinensis (Briquet ex Miyabe & Miyake) Kudô, J. Coll. Sci. Imp. Univ. Tokyo. 43(10): 47. 1921. 东北薄荷 dong bei bo he. ^ Quattrocchi, Umberto (1947). CRC World dictionary of plant names: Common names, Scientific Names, Eponyms, Synyonyms, and Etymology. III M-Q. CRC Press. p. 1659. ^ Khalsa, Karta Purkh Singh; Tierra, Michael (2008). The way of ayurvedic herbs : the most complete guide to natural healing and health with traditional ayurvedic herbalism (1st ed.). Twin Lakes, Wis.: Lotus. p. 313. ISBN 0940985985. ^ Lipman, Elinor, ed. Report of a working group on medicinal and aromatic plants. Bioversity International, 2009. ^ Farooqi, A. A., Sreeramu, B. S., & Srinivasappa, K. N. (2005). Cultivation of spice crops. Universities Press. ^ Sievers, A. F., & Lowman, M. S. (1933). Commercial possibilities of Japanese mint in the United States as a source of natural menthol (No. 378). US Dept. of Agriculture. This page was last edited on 7 November 2018, at 23:24 (UTC).